I know one woman who runs her entire 1,500-member homeowner association by herself as a part-time staff member. That's because she leaves most of the work up to her Homeowner Association Software — it essentially runs the organization for her. What is Homeowner Association Software? Homeowner Association Software, or HOA Software, is an all-in-one management tool comprised of a website builder, online contact database, communications system (email), finance & payment system, event platform, and more. Keep your residents happier by giving them easy and secure ways to manage their payments, fees, and submit maintenance requests online. Improve member communication through automated invoices, emails, newsletters, and maintenance requests. Give you an easy to build and update website where you can host a news section, notices, resources, member directory, an event calendar and more. Provide you with simple financial reports and analytics. Save money and time by automating many more administrative tasks. Wild Apricot is the one of the highest rated HOA software tools. Every day hundreds of homeowner associations use Wild Apricot to completely manage their associations. 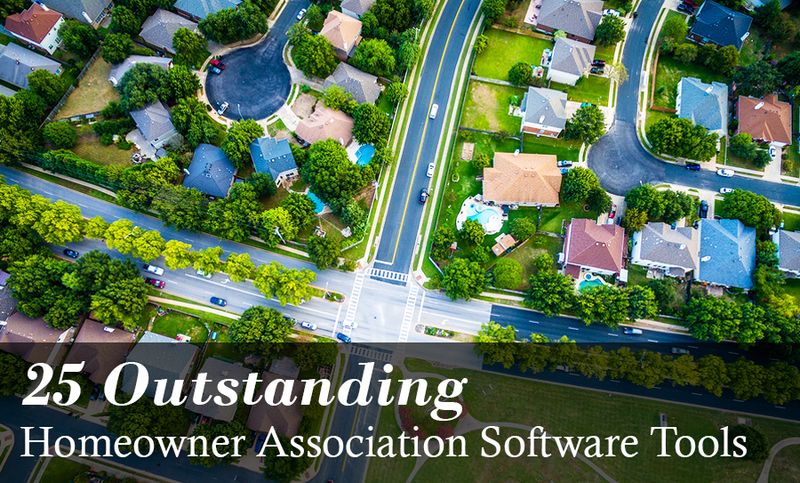 If you'd like to compare more options, there are dozens of other HOA software solutions, perfect for every type of homeowner association. Here’s a list of 25 options to consider. I’ve sorted the list alphabetically and given you highlights of each tool’s major features and the cost, so you can focus on the solutions that suit your needs. AssociationVoice is an easy-to-use, web-based software tool that allows you to collect dues via web, phone, and text. Other features include the ability to host board meetings and community bylaws, communicate community news, and set up custom forms to track HOA business. Bazinga!’s mission is to bring human relationships back into the places we call home. Their software empowers your entire community with information by making shared documents and assets accessible, and creating opportunities to connect. With Bitrix, you can create an HOA member portal that includes opinion polling, email notifications, IM and group chat, and a photo gallery. You can also manage dues, communicate with your members via email, and submit online work requests. With online member payments, maintenance request tracking, rental listing management, and full accounting functionality, Buildium is a comprehensive software solution for small to medium-sized homeowner associations. CHOPAS is designed for associations that want to improve communication between homeowners and board members. Their cloud-based system allows you to create your own portal for your association, and includes document management, community calendars and discussions, property task management, and budgeting. CINC is reportedly the only software company in the industry that provides property management, integrated banking, and cloud account all in one tool. With CINC, you can manage online payments, maintain your member directory and calendar, submit and track work orders, and share your critical HOA documents. Communitrak is a cloud-based platform designed for upscale residential communities. Features include a community bulletin board, member directories, a shared member calendar, and a safe alert notification system. You can also collect dues with online payments, reserve amenities online, and share documents with your members. Built upon Microsoft SQL Server, C3 offers integrated financial and property management for homeowner associations. With their robust system, you can manage member directories, process online payments, communicate bylaws and covenants, handle work orders, and store your HOA documents. ForwardPass is a web-based solution that includes on-demand accounting services. Features include online dues processing, community calendars, amenity reservations, standards enforcement, work order management, and complaint processing. With FRONTSTEPS, it’s easy to build an HOA branded community website. Features include the ability to track violations, dues, online payments, work orders, and maintenance requests. Gladly is a free platform to create a fully-functional website for your homeowner association. Features include a message board, community calendar, amenity reservations, and dues payments. 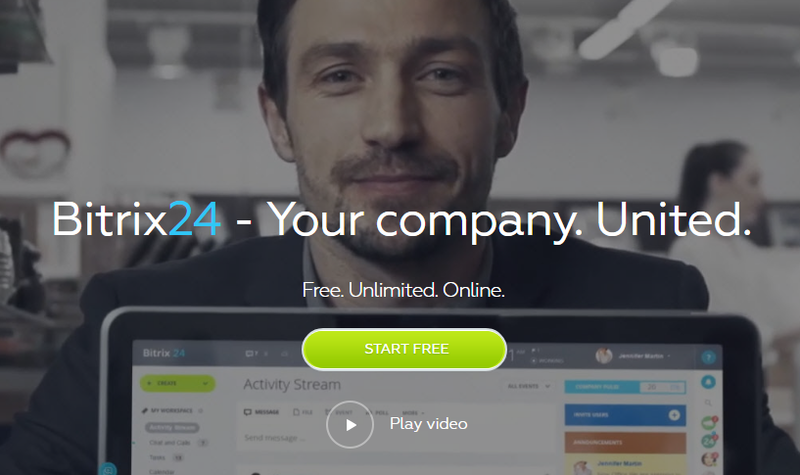 Gladly is completely free to use, but they do plan on adding paid features in the future. With Interaction Community Systems, you can manage all aspects of your homeowner association, including member directory, board member voting, online payments, homeowner violations, and maintenance requests. Helpful extras include message boards, photo galleries, classified ads, and babysitter reservations. With HOA Express, you can build an attractive, affordable, mobile-friendly website for your HOA. You’ll be able to update your website quickly and easily, send email blasts, and facilitate forum discussions. Your members can also pay their dues online. Build an affordable, mobile-friendly website for your HOA with HOA Space. Features include community discussions and polls, document sharing, classified ads, member feedback forms, photo galleries, and reservations. Build a site for your community with HOA Town’s robust website builder. You can assign member privileges to share administration of your site, create groups, email your HOA members, and customize your site to match your HOA logo or colors. Also available is the ability to integrate with Paypal, so your members can pay their dues online. Manage your HOA’s financial needs with LegFi. Their web-based tool helps you manage your HOA members online, collect dues, send invoices, track your expenses, and handle your budget. With Member365, you have everything you need to manage the members of your HOA. You can handle CRM, host your website, do financial reporting, put together your member directory, and communicate with your members via email – it’s all available in this one platform. You’ll be able to stay focused on your mission and goals when you manage your finances and share information with MoneyMinder. 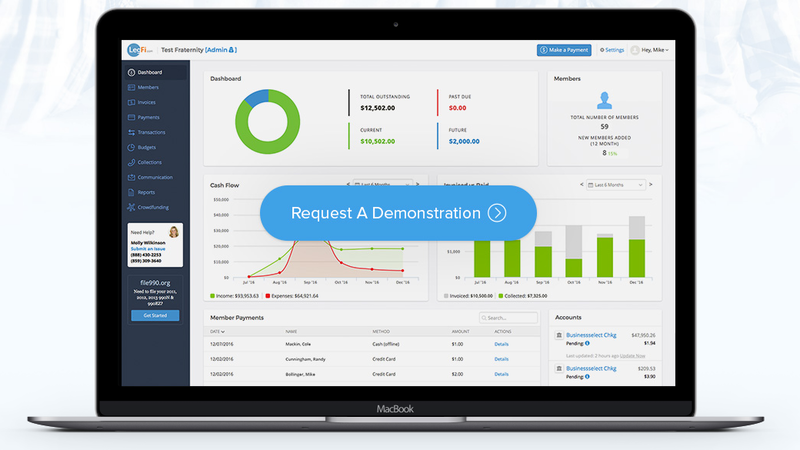 Features include the ability to create and send invoices, track HOA dues, and run financial reports. Monthli’s free platform allows you to create rosters, manage online payments, file maintenance requests online, communicate with residents, share documents, and keep an events calendar. Wondering how this platform can be free? Monthli’s website states that in the future, they’ll be providing optional paid services, like producing escrow documents, helping you find better insurance, and introducing your association to service providers and vendors in your area. MyCommunity has everything you need to manage payments, keep track of online work orders, store important HOA documents, handle event and facility reservations, and run financial reports. With Neigbrs, you can build a website and a mobile application, communicate with residents via text messages and emails, manage amenity reservations, and register users so they can access community documents. Improve relationships with the homeowners in your HOA with SenEarthCo’s comprehensive communication features. Your members will have access to HOA information 24/7, and they’ll be able to pay dues, lookup HOA policies, and submit work orders online. You’ll also be able to send them information using newsletters, online alerts, meeting minutes, and financial documents. TOPS Professional is perfect for self-managed communities. Their software includes an accounting and dues payment system that is designed for the Condo/HOA management industry, tools to enforce covenants and track violations, facility administration tools, and communication options for homeowners. Voyager HOA is a browser-based solution for managing homeowner associations. Their system features a single integrated database with tools to track ownership and HOA charges, calculate fees, collect payments, monitor maintenance, enforce bylaws, and more. Hundreds of homeowner associations use Wild Apricot for managing their memberships. Features include a drag and drop website builder, a built-in emailing system, a mobile app, a member directory, a member's-only area, and automated member payments and renewals. Free 30-day trial.